Law at the End of the Day: Just Published: "Governance Polycentrism or Regulated Self-Regulation: Rule Systems for Human Rights Impacts of Economic Activity Where National, Private, and International Regimes Collide"
Just Published: "Governance Polycentrism or Regulated Self-Regulation: Rule Systems for Human Rights Impacts of Economic Activity Where National, Private, and International Regimes Collide"
I am happy to report the publication of "Governance Polycentrism or Regulated Self-Regulation: Rule Systems for Human Rights Impacts of Economic Activity Where National, Private, and International Regimes Collide." 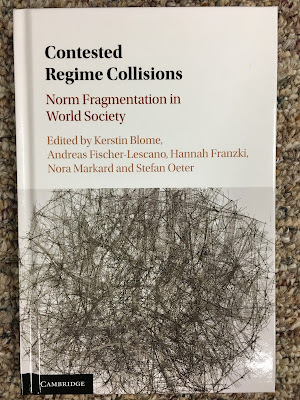 It appears as part of Contested Collisions: Norm Fragmentation in World Society 198-225 (Kerstin Blome, Andreas Fischer-Lescano, Hannah Franzki, Nora Markard, and Stefen Oeter, editors; Cambridge University Press, 2016). The contribution considers the extent to which it is possible to order the many layers of governance (law, soft law, normative standards, individual practices, contractual arrangements, custom, etc.) that together constitute the emerging "law" of human rights impacts of business activity. This layering and simultaneous application of rules (polycentricity) is likely to produce conflict or contraction (rule regime collisions) that must be mediated. Failures of mediation can impede the operation of the system to produce a coherent management of behaviors. Conventional law produced and enforced through the mechanisms available to conventionally constituted states do not serve this transnational project well. Conventional law tends to be static and substantially bound by the territory form which it emerges and in which it applies with the greatest force. The contribution thus poses the question: how is it possible to produce regulatory coherence in a system which lacks an ordering center but operates through multiple regulatory systems simultaneously? The contribution suggests that governance in action may not so much produce spaces for managed polycentric collision as it links politically posited law and private governance in what could be called an externally regulated self-regulation. These linkages do not produce order formally, but they do have the functional effect of ordering relations among autonomous actors based on the effects of their communicative interventions. It is in the understanding of the character of those linkages, as anarchic sites for mediation of collision or as the form of new multi-systemic hierarchies of regulation, that one can see emerge the nature of “law” in the 21st century. The Introduction of my contribution follows. I also provide the description of the essays in Contested Collisions from the front matter and include the table of contents of Contested Collisions. A pre publication version of the contribution may be accessed HERE. "Governance Polycentrism or Regulated Self-Regulation: Rule Systems for Human Rights Impacts of Economic Activity Where National, Private, and International Regimes Collide." ABSTRACT: The development of governance regimes for the human rights impacts of economic activity has been at the center of the evolution of governance where multiple legal and non-legal systems simultaneously apply. The regulation of these activities suggests the way in which non-legal approaches play a crucial role in the creation of structures within which the collisions of polycentric governance, its necessary anarchic character, can be managed (but not ordered). Consequently it evidences as well the way in which law (and its principles of hierarchy and unitary systemicity) plays a less hegemonic role, that is, the way in which law has less to contribute toward the governance problem thus posed. Part I considers the structures and premises of the emerging governance framework built into the United Nations Guiding Principles for Business and Human Rights (UNGP), and the three pillar framework from which it arose (state duty to protect, corporate responsibility to respect, and effective remedies for adverse effects of human rights), as it has been incorporated into the Organization for Economic Cooperation and Development Guidelines for Multinational Enterprises. Part II then challenges the formal logic of the theory polycentric anarchy with a consideration of the functional effects of implementation. Governance in action may not so much produce spaces for managed polycentric collision as it links politically posited law and private governance in what could be called an externally regulated self-regulation. In particular, Gunther Teubner’s notion of self-constitutionalizing regimes founded not on polycentricity as order without a center, but rather as the construct of a network of linkages that produces both self constitution and dependent autonomy. The linkages that tie the governance systems of states, enterprises and international bodies in the regulation of the human rights effects of economic activity, then, have substance. These linkages do not produce order formally, but they do have the functional effect of ordering relations among autonomous actors based on the effects of their communicative interventions. It is in the understanding of the character of those linkages, as anarchic sites for mediation of collision or as the form of new multi-systemic hierarchies of regulation, that one can see emerge the nature of “law” in the 21st century. It is in this context that it is useful to speak to the issue of “regime collisions.”8 The concept can be used to describe the fact that fragmentation into an increasing number of international regimes with overlapping areas of competence can lead to contradictory decisions or mutual obstruction. For some, given that such regimes are driven by radically different rationalities, this poses more than a technical problem. The problem is the same of that which confronted the political bodies when they sought to craft public international law as an ordering system among otherwise autonomous actors with distinct character and ambition. They argue, for example, that in the absence of a hierarchy of norms, only heterarchic “collision rules” can coordinate parallel action and manage collisions by allocating competences, taking into account the different regime rationales. I have suggested otherwise, positing that it is necessary to move away from state-focused legal paradigms, redolent with hierarchy and order, and to embrace ἄναρχος (anarxos), an aggregation of systems without rulers, but with an order quite distinct from the late feudalism of the law- state system embedded within it.9 I have previously written10 that what I call global law, the law of non-state governance systems, can be understood as the systematization of anarchy, as the management of a loosely intertwined universe of autonomous governance frameworks operating dynamically across borders and grounded in functional differentiation among governance communities. Considered in this con- text, the structure of global law can be understood as an amalgamation of four fundamental characteristics that together define a new order in form that is, in some respects, the antithesis of the orderliness and unity of the law-state system it will displace (though not erase). These four fundamental characteristics – fracture, fluidity, permeability, and polycentricity – comprise the fundamental structure of the disordered orderliness of global governance, which now includes but is not limited by law. These also serve as the structural foundations of its constitutional element, its substantive element, and its process element. Rather than order grounded in public international law, now transformed to serve a wider assemblage of governance actors, disorder premised on a polycentric ecosystem of competing and cooperating systems in constant, sometimes friction producing, interaction, defines the stability of governance systems in globalization. As a consequence, the problem of societally constituted organisms in a world once populated entirely by states and their creatures operating through the rigidly organized hierarchies of law, may well be the intrusion of law where it is neither necessary nor natural. The purpose of this essay, then, is to consider the issue of collision within one of its most interesting nexus points: in the elaboration of governance frameworks touching on the human rights impacts of economic activity by states, enterprises, and individuals. That elaboration produces collisions between the state and international, public, and private organizations (enterprises and civil society actors), each with their distinct governance regimes. The thesis of this essay is as follows: the development of governance regimes for the human rights impacts of economic activity suggests the way in which non-legal approaches play a crucial role in the creation of structures within which the collisions of polycentric governance, its necessary character as ἄναρχος, can be managed (but not ordered), and consequently the way in which law (and its principles of hierarchy and unitary systemicity) plays a less hegemonic role, that is, the way in which law has less to contribute toward the governance problem thus posed. The thesis is explored by considering the way in which the management of anarchy and the collision of governance regimes are being attempted through the operationalization of the United Nations Guiding Principles for Business and Human Rights (UNGP),11 and the three pillar framework from which it arose (state duty to protect, corporate responsibility to respect, and effective remedies for adverse effects of human rights),12 and its incorporation into the Organization for Economic Cooperation and Development (OECD) Guidelines for Multinational Enterprises.13 The focus of that effort has been the management of the behavior of enterprises in accordance with international human rights norms. The operationalization of that framework touches on collisions between the governance aspirations of public international organizations, the prerogatives of states, governance structures of the largest global economic enterprises, and the emergence of global civil society, media and other stakeholder communities that have morphed into members of the demoi of shifting governance communities. But rather than order and the privileging of international law, fracture and polycentric co-existence appear to be emerging as the stable state. Section I (“The guiding principles for business and human rights as framework for inter-systemic collisions”) considers the structures and premises of the emerging governance framework built into the UNGP and its points of collision with law-based systems. Section II (“From out of disorder. . . ) then considers the ramifications of collision and the possibilities for systemic equilibrium by reference to three questions suggested by the thesis: (1) What may be the role of law for the solution of collision problems, and how does that role relate to non-legal regimes? ; (2) What may be the role of non-legal approaches to a solution, and how do they relate to law? ; and (3) What might concrete solutions look like? Law remains an important element, but no longer the sole ordering principle of a unified system within which rule collisions may be resolved. Non-legal systems built around societally constituted governance organisms, autonomous from each other and from the law system with which they collide, may better serve as the framework for mediating collisions among these constellations of governance orders. The most useful means for providing these collision management structures may be sought within public international organizations that provide an arena within which such collisions may be made predictable and their results more certain. The answers may not be positive for those who still cling to the ideals of the primacy of law. First, law both supports and impedes solution to collision problems precisely because, by its nature, it invariably seeks to privilege itself over non-law regimes. Second, the societally constituted autonomous regulatory regimes that can produce increasingly dense networks of jurisprudence with the functional effect of customary law but in the absence of the state is threatened by law, which seeks to subsume societally constituted systems, and the social norms that animate it, within the domestic legal orders of states. Third, the concrete solution may well look like the UNGP–OECD Guidelines framework itself. 2 Zürn, “Sovereignty and Law,” pp. 39–71. 3 Falk, Predatory Globalization; Sachs, “Beyond the Liability Wall,” p. 843. 4 Weissbrodt, “Keynote Address,” pp. 384–90. 6 But see Calliess and Zumbasen, Rough Consensus and Running Code. 7 Consider in this light, Alston, “The ‘Not-a-Cat’ Syndrome,” p. 17; Johns, “The Invisibility of the Transnational Corporation”; Ward, “Securing Transnational Corporate,” pp. 461–2. 8 See, e.g., Teubner, Constitutional Fragments. 9 Backer, “Transnational Constitutions,” p. 879. 11 Special Representative of the Secretary-General, “Guiding Principles on Business and Human Rights,” endorsed by the UN Human Rights Council in 2011. UN Doc. A/HRC/ RES/17/4 (July 6, 2011) [hereafter UNGP]. 12 UN Human Rights Council, Forum on Business and Human Rights, A/HRC/FBHR/ 2013/2, para. 10. 13 OECD, Guidelines for Multinational Enterprises (2011). Contested Collisions: Norm Fragmentation in World Society (Kerstin Blome, Andreas Fischer-Lescano, Hannah Franzki, Nora Markard, and Stefen Oeter, editors; Cambridge University Press, 2016). 13. On the critical potential of law – and its limits: double fragmentation of law in Chevron Corp. v. Ecuador Hannah Franzki and Johan Horst.